Using an automated hemoglobin analyzer, for instance, has enabled fast, accurate, and reliable results in the field of hematology. A hemoglobin test may rely on different techniques, including reagent based and “reagent-less” methods, or a variety of non-invasive methods. Using the principle of hemoglobin conversion to cyanmethemoglobin by adding ferricyanide and potassium cyanide, the HiCN method of hemoglobin measurement can proceed. 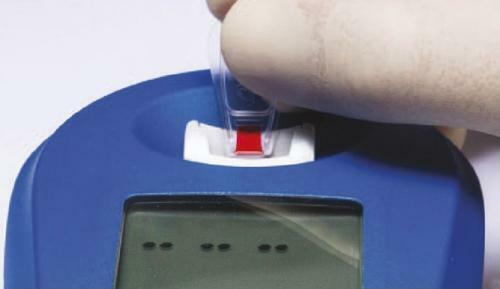 Advantages of this type of hemoglobin test is the availability of an internationally accepted reference standard calibrator.1 The HiCN method is still routinely used in clinics especially in resource poor countries; however, its time-consuming and cyanide-dependent protocol gives it a higher relevance as a reference method for POC hemoglobin devices and analyzer calibration. Point-of-care (POC) hemoglobin measurement devices, such as the HemoCue® 201 and EKF Hemo Control, operate on a modification of Vanzetti’s method. First, blood is pulled into a dry reagent cuvette by capillary action. Secondly, the reagent destroys the red blood cell walls. Free hemoglobin is then oxidized to a methemoglobin and finally converted to azide methemoglobin. The susceptibility of the reagent to humidity represents a challenge associated with this method. Due to the limitations of reagent-based cuvettes, POC devices have been developed to feature “reagent-less” cuvettes. HemoCue® 301 was the first POC device to possess such a feature. This device quantifies absorbance of oxygenated and deoxygenated hemoglobin, while turbidity is measured and compensated for at 880 nm. Currently an EKF Diagnostics company, DiaSpect represents a leader in new technology that measures hemoglobin without a reagent based on broad spectrum photometry. The DiaSpect technology flashes a white LED light through a sample to an optical sensor component. This sensor element identifies absorbance of the blood at a broad wavelength range that will provide insight into the overall absorbance spectrum resulting in a higher specificity and a lower sensitivity to interferences. “Reagent-less” Diaspect cuvettes feature extensive durability with total self-life of 2.5 years. Just about one second of measurement time is another benefit of this type of device. 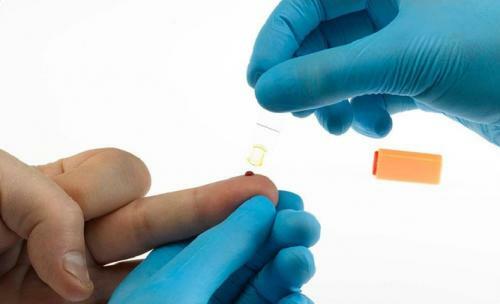 With the availability of new technologies to detect the spectral pattern and concentration of hemoglobin, non-invasive methods have become more frequently used, first introduced for monitoring during surgery and lately to provide hemoglobin spot checks in primary care and in blood donor qualification. Some non-invasive devices use pulse oximetry while others rely on white light and the capturing of transmission data to measure hemoglobin concentrations in tissue capillaries. Occlusion spectroscopy is a noninvasive measurement technology featuring a ring-shaped sensor that is attached to the subject’s finger.5 The sensor temporarily ceases blood flow, initiating an optical signal which yields a high signal-to-noise ratio. This provides a measurement of hemoglobin concentration. Sahli’s hemoglobinometer is a manual device that contains a hemoglobin tube, pipette, and stirrer, as well as a comparator. Hydrochloric acid converts hemoglobin to acid hematin, which is then diluted until the color of the solution matches that of the comparator block. An automated hematology or hemoglobin analyzer is commonly used for providing high throughputs to analyze a variety of red and white blood cells as well as hematocrit and hemoglobin levels from the blood sample. These analyzers offer higher precision value at a fraction of the time when compared with manual methods. The initial cost of an automated analyzer is high and regular maintenance and the laboratory personnel that are needed for the device can increase costs. Additionally, stable climate conditions are required which makes it an unsuitable option for non-laboratory environments like mobile blood donor test sites and anemia screening projects out in the field. Typically used with arterial blood, BGAs measure the combination of blood gas, pH, electrolytes, and metabolite parameters. Some laboratories may use BGAs for hemoglobin testing, but they are more commonly seen in critical care units, delivery wards, and emergency rooms. The recent development of ready-to-use sensor and solution cassettes with automated calibrations has made BGAs more user-friendly and robust, but maintenance is still required. With the latest innovation of hand-held devices operating single use cartridges BGA has become available for use in mobile settings, too. Shah VB, Shah BS, Puranik GV. Evaluation of non-cyanide methods for hemoglobin estimation. Indian J Pathol Microbiol. 2011;54(4):764-768. Vanzetti G. An azide-methemoglobin method for hemoglobin determination in blood. J Lab Clin Med. 1966;67(1):116-126. Srivastava T, Negandhi H, Neogi SB, Sharma J, Saxena R. Methods for Hemoglobin Estimation: A Review of “What Works.” Journal of Hematology & Transfusion. 2014.
van Assendelft OW, Horton BR, Parvin RM. Calibration and control in haemoglobinometry. Clin Lab Haematol. 1990;12 Suppl 1:31-42. Pinto M, Barjas-Castro ML, Nascimento S, et al. The new noninvasive occlusion spectroscopy hemoglobin measurement method: a reliable and easy anemia screening test for blood donors. Transfusion. 2013;53(4):766-769.